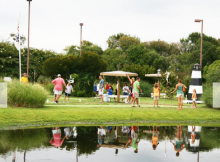 There are many amazing golf courses on the Outer Banks, but what is better for family time than a unique 18-hole putt- putt course or go-carts. These are just a few other things that make your trip to Corolla that much more fun. So grab the kids and head out to one of the water front courses offered in the area. The Golf Links is an Outer Banks miniture golf course that is located right next to Kitty Hawk Water Sports in Timbuck II in Corolla. It features some holes on an island, great views and unique obstacles.